I was depressed too until I realized that list completely omitted Rae Burrell for Tenn, who is ranked #44 overall by Hoolgurlz, giving them the #6 recruiting class, instead of being #2 in the SEC after SoCar per ASGR. Maybe you too should take the ASGR report with a grain of salt. The signing period hasn't started yet...I wonder if these 2 signed early and they just didn't announce it until now. Per Raoul on Twitter, Kenny Brooks’ daughter Chloe, 5’10 G out of Spotswood HS (Penn Laird, VA) will sign with Va Tech next week. She’s a 4-year varsity player for Spotswood. There’s a link to an article but it’s paywalled. Sam Brunelle announcing her school.of choice in a few should be interesting. Grumbles of ND but i would not count Geno out ive learned that much at least. Think this years title run played a factor in Brunelles decision? Not to be pedantic, but Brunelle is a 2019 commitment and is posted in three other threads. USCe Gamecocks add Elysa Wesolek, a 6'1" F who originally signed with WKU but was released with the coaching change. 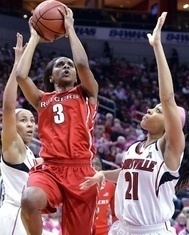 Rutgers add Israeli National Team member Noga Peleg Pelc, and Rhode Island transfer Charise Wilson. Whalen gets her 2nd commit — Minnesota gains 5’10” PG Mercedes Staples (Hoopgurlz #64) from Viewmont, UT. She originally was committed to Clemson before Audra Smith was fired. 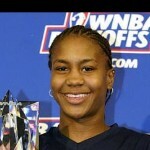 Staples is a 5-10 PG who is ranked #63 by Collegiate Girls Basketball Report. This is a huge commitment for Coach Whalen, getting a top 100 kid for her first year as head coach. Incidentally, Staples credited her club basketball coach, Natalie Williams (yes, former college basketball star in basketball and volleyball and former WNBA star), for working hard to help her get noticed. The Quse Orangewomen add a player after her team won the B Division of the Fiba U20 tourney last week. Veronika Vorackova, a 6-2 forward from the Czech Republic will join the team this Fall. The Czech Republic won the undercard tournament in the Fibas. Veronika Vorackova was the MVP of FIBA U20 B in 2018.